For those who love tunes and the ability to take them along wherever you may roam, there are some great auto sound systems that allow you to basically plug in your favorite tunes to play as you go. It doesn't really matter which style of MP3 player you use, most of the newer auto sound systems at least have the ability to read and translate the material from these players into great music for you to enjoy on your ride by simply plugging your MP3 player into the car stereo. Many of us find that lugging around an MP3 player with all of our favorite tunes (or at least most of them-with up to 40 gigs of hard drive space it might take a while to fill completely) is much easier and more practical than attempting to lug around a huge case of CDs. It is also great for those of us who find ourselves disappointed when we purchase CDs only to find that we really only like one or two songs. Now we can simply download the songs we know and love while avoiding those we are uncertain about or at least waiting until more songs come out before deciding whether or not to purchase the entire collection of songs. Having an auto sound system that allows you to enjoy the convenience of simply plugging in either your MP3 player or a memory card or stick in order to have your favorite songs at your finger tips at all times is fantastic. I don't know about you, but I am absolutely hooked on audio books. I love to read and find so little free time in which to get my feel of the latest and greatest best seller. Audio books allow me to hear the stories I've been eagerly awaiting at my convenience and in my SUV as I'm making my daily commute or running errands. These books are also a great way to enjoy long car trips. You can even check your local library in order to find an excellent selection. I typically try to find stories that might interest the children on long car rides as well (such as the Harry Potter books or The Polar Express). This instills a love of reading in them and I don't have to worry about the stray 'grown up' word that some audio books contain. Good auto sound systems not only play great music but also sound wonderful when it comes to the spoken word as well. This is not only true when it comes to books on tape, CD, or MP3 but also talk radio and national news stations as well. When you begin your search for your next auto sound system make sure you consider all the possible features you may wish to include. You can find sound systems today that include GPS, DVD players, navigational tools, CD players, MP3 players, satellite radio receivers and countless other nifty features. 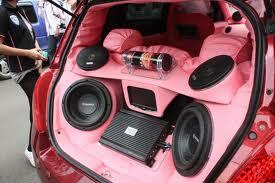 Choose the auto sound system that will suit your needs and interests best and enjoy it for as long as you can. A good sound system is something that will stay with your car, truck, or SUV so it is best to make that particular investment long before you plan to trade your vehicle in on another. At the same time a good auto sound system can be an excellent incentive to hold onto your vehicle a little while longer.